Yes. In the Dashboard menu, choose Messages and click Create Newsletter or Create Autoresponder. After completing the initial screen, click the Next Step button at the bottom to go to the Template screen. Click the Import link on the left side. 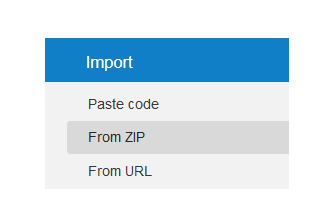 This allows you to import your template into GetResponse by pasting the code, importing a zip file, or downloading it from a URL. All your saved templates can be located under My templates tab on the left side menu. Please do not paste the code from MS Word, Wordpad or any other text documents except Notepad file. This may cause serious issues with the message editor and the message design.